Captain Jane Povich trudged wearily along the spartan corridor towards the automatic doors at the end. They were merely two sliding plates of pressed alloy but as they would swing open they would do so on the final chapter of her career and she knew it only too well. At each of her shoulders was a burly security officer from the ranks of the Olympus crew. She glanced back to the stony faced expression on a man who refused to meet her gaze, his eyes churning with hatred towards her that sickened her to her stomach. She knew what she’d become to the eyes of Starfleet and now saw her action in the same light and was beginning to despise herself for it. The three of them finally reached the doorway and the man behind stepped forwards and pressed the request access button. A chirp sounded from the electronic hatchway and then silence. She bit her lip nervously while the seconds ticked past in the corridor, an awkward silence permeated the atmosphere from her two guardians until the reply finally issued from the speaker. “Bring her in!” The voice said with a stoic formality to the words that barely masked the contempt of the person who had spoken them. The doors slid open on the large briefing room at the rear of the Olympus bridge. At the head of the table sat Admiral Crowe, a high ranking officer with a long running involvement in Starfleet intelligence and a poor person to cross in the way that the Captain had. She looked over to the other faces that glared back at her coldly. Captain Reader she knew already and several other faces were familiar also. “Sit down please!” The Admiral told her, the tone of her voice hiding little of her resentment. Captain Povich duly complied with the instruction and sat at the foot of the table with her head hung sadly as if in defeat. Ensign Katherine Rogers knotted her fingers together tightly as she glowered with a hatred she did little to disguise. “Yes sir.” The Captain muttered in agreement. “I intend to co-operate fully.” Captain Povich told her, her voice low and apologetic as if that of a small child being scolded by an angry parent. The Admiral nodded to herself in satisfaction, her hands together in front of her face. “I understand.” She said softly. “May I say something before I start.” The Captain swallowed nervously. “Continue.” The Admiral agreed grudgingly. “I think it’s a little late for that!” Katherine scowled. “He was.” Katherine agreed with unmasked hostility. “Please begin!” The Admiral turned from her written reports. “I’ve analysed the data that Reader sent us!” Haldo shrugged at the Corinthian's briefing table. “And?” Captain Girling asked as he gestured for him to continue. “Is it a threat of some kind?” Katherine asked. “There’s definitely radiation coming off of it which is why it wasn’t detected before but I don’t see that it would pose a threat to the outer systems. It’s coming in very slowly.” Haldo shrugged. “So why send us?” Katherine asked, glancing around to the Captain. “I suppose.” Haldo huffed as if in only part agreement but deep down he loved the ship as much as anyone, maybe more. “So we go then?” Katherine asked. “Who knows?” Blake scratched his head and smiled thinly. 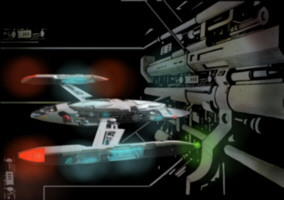 The nacelles retracted back into the sides of the hull as the internal systems reconfigured, sending power to the field emitters to generate a Transwarp portal in which the ship could travel beyond warp speed. With a flash the small ship was drawn into a glowing blue vortex of swirling energy, a temporary tunnel through the fabric of subspace. Captain Girling sat at the command seat at the heart of his bridge as the tension grew among the crew during the long journey. “Something is definitely wrong!” Haldo said, adding to the growing uneasiness. “How long?” Captain Girling called out. “Transwarp threshold contact in 2.4 minutes.” Goruss Clogg called out from his station. “Structural integrity fields are stable.” Clogg reported. “I think we can make it.” Haldo agreed. “You think?” Blake turned to his engineer. “Let’s make sure that doesn’t happen!” Blake agreed with a grin. The Corinthian exploded out of the conduit in a blaze of glowing energy, tumbling slightly as her thrusters fired to correct her geometry. “I’m isolating it and cutting power.” Haldo told him, his fingers dancing wildly across the computer interface. Blake frowned deeply, concentrating on the computer, his mind trying to overcome the problems. “I’ve got it.” Captain Girling sighed in relief as the coil dematerialised from its mountings and appeared off the ship in a ball of glowing blue light. “Shields are up!” Goruss Clogg shouted, his eyes fixed on the glowing orb as his panel warned him of the amount of raw energy broiling away inside the coils. “It’s not good, is it?” Ensign Rogers asked with a sense of impending doom. “From my readings it’s bad. Very bad.” Haldo shook his head sorrowfully as the coil went cold and dark, a smouldering block of metal floating haphazardly in space. “The coil is fused, isn’t it?” Blake sighed. “I think so.” Haldo agreed softly. Doctor Jones turned to him and shook his head sadly. “How long will it take to get home at maximum warp?” Blake asked. “And it would take us two years to replicate a new coil because of the complexity of the linings.” Doctor Jones added for good measure. “Are you serious?” Doctor Jones started in surprise. “Me and him?” Haldo asked, folding his arms over his chest and scoffing at the idea. “It’s not open for debate.” Blake turned to him with a look of utter resignation. 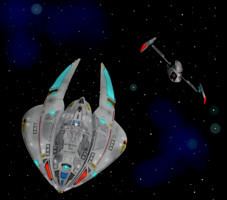 The Corinthian's nacelles swung out from the narrow hull and locked forwards to allow the normal warp drive to operate. Blake led the Haldo Compz and Doctor Jones along a seemingly unfinished tunnel to the rear shuttle-bay. “So you finally found the shuttle?” Haldo asked as the sound of their footsteps echoed around the bare metal corridor. Haldo frowned to himself. “I thought there was only a Type 6 in here?” He asked. “We have a wide variety of shuttles in the bay.” Captain Girling told him with a smile. “And we’re ignoring the fact that that’s impossible?” Haldo added for good measure. 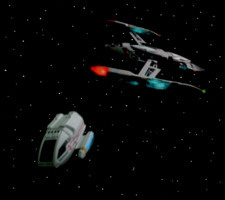 The Corinthian glided away from the shuttle as the small boxy craft left to retrieve the wreckage of the Transwarp coil. The ship slunk along towards the object, scanning forwards with her powerful detection grid. “I’m detecting something…” Ensign Rogers told them as she temporarily manned the science station. “I should hope so.” Blake said sarcastically as the massive object swam into view in the holographic projector at the fore of the bridge. The object was massive, a huge irregular mass of machinery with two gigantic opening at the front that could easily swallow a pair of Galaxy class Starships. “What is this energy spike you’re detecting?” Blake asked, turning away from the impressive spectacle of the huge lump of machinery tumbling lazily through space. “Red alert!” Blake said firmly as the weapon systems on the Corinthian instantly snapped into a state of readiness, the exposed sections reconfiguring to fire energy beams and the forward Phaser cannon glowing dully to life. Blake smiled to himself. Adjusting the beam intensity was something he could do himself in an instant with his neural connection to the ship but he wanted to see if his new officer was capable of applying subtlety as well as he applied caution. “The beam is ready and I’ve got a manual lock on the target.” Goruss Clogg reported finally after a few seconds of calculations. The Phaser cannon in the nose fired a steady stream of crackling orange energy into the cloaked vessel. The ship flickered as the cloak began to fail and then suddenly the field collapsed with a crackling surge of electricity that licked across the ships hull. “How did it get out here?” Katherine asked. The vessel swam large in the viewer, a rounded forward hull with two long booms snaking backwards containing the warp nacelles that glowed a deep flickering blue. Haldo Compz sat at the command chair aboard the small type 6 shuttle as the Corinthian's Transwarp coil showed on the scanner display. He punched the padded wall and was mildly relieved that it felt as solid as he thought it should. He nodded to himself and glanced over it with a mild suspicion before turning his interest back to his work. Haldo ignored him and continued his scans. “You still don’t like me, do you?” The Doctor shook his head. “I know all I need to know about you and people like you.” Haldo growled. Haldo opened his mouth to speak but somehow words failed him. “It’s a tough Galaxy.” Haldo grumbled emptily. “Is that what you believe?” Haldo asked quietly. “Maybe the Borg started by thinking that way.” Haldo sneered. “And what about my kind?” Haldo argued but without much passion. Haldo turned his attention back to the display while his mind chewed over what he’d heard. “I guess we should beam the coil aboard.” He said finally. “We could beam it into the passenger compartment but we’ll have to erect a force-field around the control room.” The Doctor replied thoughtfully. “Agreed.” Haldo said with a hint of reluctance. The torchlight didn’t seem to make a lot of difference on board the abandoned ship. Blake scanned the corridor with his tricorder and squinted but the dim emergency lights seemed bright to his eyes and he wondered if they were unusually bright or some implant was at work inside him. The air was stale and tasted dirty as he sniffed in a deep lung full. Service panels were missing where the crew had made brash repairs or possibly fed the plating back into the replicator for energy. All around him were signs of a ship that had slowly ran out of hope with a resourceful crew making constant adaptations as she went. Goruss Clogg stood behind them brandishing a phaser pistol. He was clearly agitated and snapped around suddenly, raising his weapon at shadows. “Something happened here!” He replied, his voice low and respectful, as if he knew he was walking on someone’s grave. “And me, sir?” Clogg asked. “Go with Ensign Rogers.” Blake told him as he nodded towards her. “Perhaps the engine room?” Clogg suggested. Haldo Compz stepped onto the Corinthians bridge to find it deserted except for the two officers at the front who always worked in silence. “We really need to find a name for those two!” Doctor Jones pointed to the two officers. “And what the hell is that?” Doctor Jones pointed to the scout ship floating in the viewer. “I could check the protected Section 31 files?” Doctor Jones suggested, eager to help. “How’s my Transwarp coil?” Blake asked. “Yes sir!” He replied enthusiastically. Goruss Clogg stepped into the main engineering bay. It was a large room in comparison to the slightly cramped feel of the rest of the vessel. The consoles were still alive with scrolling engineering displays but the lights were low and the support beams were bathed in dull red lights from the emergency batteries. He slowly made his way across the bare metal floor towards the warp core. At the heart of the room was the reaction chamber, fed from a towering pillar of flickering blue light wrapped in polished metal. He glanced down the column which disappeared into an opening in the floor. The system appeared to be functioning although the power levels were helplessly low. He ran his hands over a service panel where the hatches had been discarded on the floor. Behind them was a jumbled mess of circuitry where some kind of repair or modification had been started. He took a deep breath and turned away from the core. He could feel his heart thumping in his abdomen at the way the craft felt. There was an almost tangible sense of malice to the ship, as if it was floating up to his senses on the stale recycled air. He could hear every chirp from the controls, every sigh of the hull as it flexed uneasily with the stuttering energy from the support fields. He shook his head to dispel the images that were haunting him as he reminded himself firmly that he was a professional and a professional tactical officer at that. As he continued his cursory exam he noticed a large piece of machinery behind the core. He looked over the thing, a tall mass of jumbled equipment with a dull yellow glow throbbing uneasily inside it. It was connected up to the power matrix with a mass of cabled and hard-point circuits that had been pulled from the banks of systems. “Computer?” He asked. His inquiry was replied to with silence. He cursed silently and stared fixedly at the modifications to the engines. Something just didn’t feel right. Captain Girling stepped onto the bridge of his ship with Katherine and his chief security officer. “I’ve found some details about the Pulsar!” Doctor Jones stood up in his enthusiasm and pointed wildly at the ship that drifted before them. “Go on!” Blake told him as he settled into his command chair. “And the Nova proved to be the superior ship and was adopted?” Katherine suggested. “So what’s it doing out here?” Blake asked rhetorically, rubbing his chin thoughtfully. “So it’s not Starfleet?” The Doctor frowned. “I think we should be more interested in what happened to the crew?” Goruss Clogg told them from his station. “If it is a ship!” Katherine shuddered involuntarily at the daunting sight of the vast alien craft. The object was a gigantic hulking mass drifting listlessly through space. It was a vast irregular shape with appendages clawing out from its tattered heart. A gaping entrance lay at the front big enough to swallow a fleet of small vessels. Hull plating was jagged and torn from minor collisions that had occurred in its journey and engineering sections lay smashed over its body. The Corinthian drifted cautiously towards the massive craft as her powerful scanners felt their way inside as best they could, reaching out to caress it with unseen fingers of energy. “Can we transport?” Blake asked as the image filled the viewer. “You want to go inside?” Clogg asked in disbelief. “Atmosphere?” Katherine asked in surprise. “Yeah, but would we want to?” The Captain smirked. 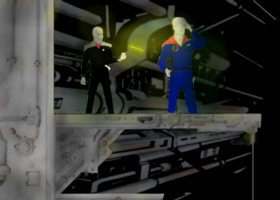 The four of them materialised in a large hollow chamber with bold engineering pipes running through the roof and walls. The material was metallic and was heavily stained by corrosion and wear. Every footstep they made sent echoes bouncing around the cavernous hall as the four of them glanced about. “Any idea how old this thing is?” Blake asked as he stepped closer to a rusty metal pipe. Haldo led the group to the far end of the room, his eyes fixed on his tricorder as he shuffled along in the gloom. “There!” He pointed. At the edge of the room was a small cylinder with a glowing metallic dome and a series of small vents around the edges. “Which only leaves the question of what happened to them.” Goruss Clogg said coldly with a hint of nervousness as the possibilities sent a shudder up his spine. “Human?” Katherine asked with a growing sense of Clogg's infectious trepidation. “I can’t tell.” He shrugged as he began walking towards his findings. Doctor Harold Jones sat at his console on the bridge of the Corinthian. The external view showed a gloomy image of the small ship inside a cavernous bay of twisted and ancient metal. He quietly continued his investigation into the Pulsar, a missing vessel that had never made enough of an impact to be mentioned in Starfleet records. She had been crewed by a small number of officers for her trials but they had all gone on to serve on other vessels and were easily accounted for. He glanced up at the weathered vessel and a cold shudder traced it’s way up his spine like a spider crawling over his flesh with venomous fangs poised to sink into his unprotected flesh. He breathed out and shook his head and smiled at his own lack of scientific objectivity. He looked up again and with the press of a few buttons the viewer showed the bay that they were inside of and the shudder returned. It was claustrophobic, as if the metal around him were mocking him, as if her was in the hand of some gigantic metal demon that was about to close it and capture him forever. Blake kept his body close to the wall as the pair made their way quietly towards the life signs before them. Clogg remained slightly behind him, slightly nervously which was deeply out of character for him. Blake silently made a mental note to have a long discussion about his attitude at a later date. Perhaps he wasn’t the right man for the job after all. They rounded the last corner to find a short corridor which led to a small room at the end of a greying mess of bulkheads and tubing. A small yellow emergency light flickered in the distance, the first sign of movement that they’d actually seen beyond the shadows that were sent scurrying from the darkness by the light of their own torches. Blake gestured to Clogg that he intended to go first and made his way as quietly as possible along the narrow path. He gingerly felt his way along, the floor-plates were so old that they were beginning to break up in places. He finally reached the doorway and with his phaser pistol raised he stepped quickly inside. Two dishevelled faces glanced up quickly to see him. Two pairs of hollow, frightened eyes gazed up with a mixture of fear and relief at the sight of him. They were both dressed in old style Starfleet uniforms with red shoulder flashes but their uniforms were tattered and damaged, dirt was strewn down their faces, streaked with sweat and grime. Slowly a woman stood up nervously. She swallowed hard and her lips began to flutter into a weak smile. “Starfleet?” She asked, his voice low and husky. “I’m Captain Blake Girling!” He replied, lowering his weapon and stowing it in the holder at his belt. “What happened?” He asked, glancing down to her first officer who had remained seated on a bare metal tube. He had closed his eyes in relief and was beginning to laugh quietly to himself. “Where’s the rest of your crew?” Clogg asked pointedly as if it was an accusation. “You’re all that’s left?” Blake shook his head in dismay. “We’ll beam you back to our ship. I’ll have my medical officer check you over and get a decent meal inside you and then we can discuss this more thoroughly.” Blake suggested. “Right now.” Blake nodded and smiled back supportively. Captain Girling sat opposite Captain Povich and her first officer with Katherine at his side in the briefing lounge. “This is an interesting ship!” Captain Povich said uneasily, casting a glance to Commander Garret. “I’d like you to tell us what happened.” Blake told her firmly, leaving her little room for manoeuvre. “By the time we got here, everything was damaged.” The Commander smiled wistfully. “Why did you come here?” Katherine asked. “What was the mission?” Blake asked, leaning towards her. “So how were you stranded?” Blake asked, shaking his head slightly as he thought that her answers were too measured and evasive. “How long did it take to get here?” Captain Girling leant back and folded his arms. Haldo Compz continued with his work on the derelict vessel after taking a Type 6 shuttle over with a load of scientific research material. He had examined every part of the vessel he could detect while Goruss Clogg scanned through the base camps logs. “So what do you think?” Clogg asked conversationally as his computer racked through their records. “Then what the hell is it?” Clogg asked, intrigued. “Any idea what that was?” Haldo asked. Goruss Clogg glared at him for a moment without saying a word, his eyes narrowed defensively as troubling thoughts began to run through his mind. “This object?” He muttered. Haldo swallowed hard as the smile vanished from his face. “Your paranoia is a welcome addition to this crew.” He mumbled. “You’re lucky.” She scowled thoughtfully. “Tell me about it.” He said. “It must have been hard.” Blake said softly. Captain Jane Povich hung her head and breathed out heavily, lost in her inner torment. “What about that drink?” Blake's voice cut into her train of thought. “Red wine.” Blake nodded as a shimmering blue light appeared on the table before her as the replicator fed the pattern into the transporter in accordance with Blake's unconscious whim. “This ship is a little unusual.” He shrugged as she scooped up the glass and sipped haltingly at the wine. “I have to ask…” Captain Girling began. Captain Povich hung her head again as she cradled the wine, gazing at it is if the answers were slightly out of focus inside somewhere and perhaps if she looked deep enough she’d be able to see them. “He’d killed them?” Girling asked. “What happened to Lynch?” Blake asked softly. “I take it the others came to a similar end?” Blake suggested. Haldo sat back thoughtfully while the tricorder completed its scan. “Is there any point in you even being here?” Haldo smirked. “You do realise that there’s only one way we’re going to be able to find out much more about what this thing is.” Haldo told him with a tone that implied he felt largely the same way. “So what do you think?” Blake asked as Ensign Rogers flicked through the reports. “I don’t know.” She sighed. “Medically their stories check out completely. They were there as long as they said and the three surviving officers never left the confines of the shielded areas. It’s possible that the force-fields protected them from harmful radiation that we couldn’t easily detect. “Apart from a state of the art science ship that went missing from a development storage hangar!” Blake reminded her. “So perhaps they were sent by Section 31?” Girling suggested as he scratched his head thoughtfully. “So what do we do?” Katherine shrugged and passed him back the reports. “We need to explore the ship!” He said finally. “Rather you than me.” She shuddered. Haldo was reluctant to leave the base. The vessel moaned and sighed as it drifted lazily through space, the ancient engineering creaking as the parts flexed together, and more worryingly, apart. At times the floor plating moved slightly as you walked over it with a stomach knotting sound of tearing metal from deep in the confines of the vessel. “I’m detecting something up ahead.” He said softly, standing behind the others nervously. “Keep me posted.” Blake told them. “It’s not far.” Haldo spoke with a hint of trepidation. “Just up there.” He pointed along to the end of the corridor where a large mass of pipes and other engineering vanished into a room. “Come on.” Blake told them as he began walking along the unlit shaft with his torch in one hand and his phaser in the other. “Any idea what this thing was?” Katherine asked conversationally to break the uneasy silence. “Perhaps their version of a warp drive?” Blake suggested. The three stopped outside the entrance. It was merely that, an open hatch with no door or other affectation. There was nothing but an open hole to walk through amidst the pipe-work and corroded metal plates. “I’ll go first.” Blake told them. “I’ll go home.” Haldo grinned thinly, hiding as best he could behind his humour. With that, Captain Girling stepped into the room. Haldo and Katherine waited in silence in the empty shaft. They watched with disproportionate interest as the light from his torch moved around sending shadows dancing from the opening like ghosts haunting the ancient metal. Blake stepped out of the room and swallowed hard. “Right.” Haldo said with a shudder of clear fear at the very thought of going in there. “I’ll come in.” Haldo nodded and took a deep breath. “You’ll be fine.” Katherine told him and took his arm as the pair stepped gingerly into the control room. The room was large, a corroded metal cube with banks of equipment and structural supports. The middle had a raised section with a concentration of displays and controls. “They certainly think bigger!” Katherine added. “Do you think you could get any of this stuff working?” Blake asked him. Haldo shrugged and stepped forwards to the first console he came to. It had a shiny black reflective surface although the face was littered with dust and debris and the corners had frayed and began to roll up from the casing. Down each side were rows of unmarked buttons and a few small switches. “So you established this base to begin your surveys of this ship?” Goruss Clogg asked the Captain. “Yes.” She agreed, her arms wrapped around herself nervously as her eyes darted around, scanning the shadows for movement. “How long were you over here away from the Pulsar?” He asked as he ran his eyes over his notes on a portable Padd. “I see.” He nodded with the appearance of a man who was deeply unconvinced. “I have two small issues to raise with you about your story.” He began, dropping the Padd to his side and glaring down into her frightened eyes. “Which are?” She asked, wrapping her arms around herself even more tightly. “The computer problems stopped you being able to communicate with your ship to beam back aboard?” He began. She nodded weakly in reply. “And yet you had already sent the holographic matrix message back to Starfleet command as there is no sign of it here.” He told her. “We left the inner bay of this ship to send the message and then came in closer to beam our people out.” She explained. “We’d already cleared them away.” She stammered nervously. “I don’t believe that you could have.” He told her flatly. “You cannot talk to me this way!” She told him angrily. “I need to think.” She glowered at him. “Found anything yet?” Blake asked as he wandered aimlessly around the alien control room. With power off the controls were all dark, no lettering for the universal translator to work on and no back-lit displays to give vital clues of the purpose of the vessel. “How did he die?” Haldo shuddered openly at the thought of a similar fate befalling them. “But this is definitely the control centre?” Blake asked, turning his attention back to Haldo. “So that leaves the questions of who built it, what they used it for and why did they abandon it!” Blake rubbed his chin thoughtfully. “I’m just happy they did.” Haldo breathed a sigh of relief. “At least we know that this installation had a benign purpose.” Katherine smiled. “Well they must have been looking at a different part of it to what we’ve seen.” Haldo grinned. “Maybe we’re looking at this all wrong!” Captain Girling suddenly stopped pacing and turned to the others. “Ok.” Haldo agreed with a degree of enthusiasm as he snapped open the Tricorder panel and began with a sensor sweep. “What are you looking for?” Katherine raised an eyebrow quizzically. “We could take a shuttle up there and beam in at short range.” Blake suggested with a grin. Doctor Jones continued running scans as deeply into the vessel as the sensors were able to penetrate while he attempted to increase their range with every trick he could possibly imagine. “Damn it.” He sneered as his latest modification actually managed to decrease the sensor resolution by ten percent. He frowned to himself as a small red flashing box appeared on his portable Padd. He picked it up and accessed the box that told him a private message had been received. He glanced around himself guiltily as if caught in an act of criminality as he wondered what could be going on. The message asked him for his identity, requesting him to place his finger on the screen so it could read his bio-electric aura. He took a deep breath and pondered his next action carefully with an expression of deep suspicion. There was no real reason why a person would attempt to contact him in a manner that would circumnavigate the ships systems unless they were trying to keep it a secret from the Captain and crew. His finger hovered over the access button while his mind was split equally over what to do. Finally his latent curiosity won out and he hesitantly pressed the button. The message flashed open with text only, a short written communication. He closed his eyes for a moment. In the short time he’d served as a crewman aboard the Corinthian his attitudes had changed. His life had changed and his loyalties had followed suit. “Jones to Goruss Clogg.” He said as he pressed his Comm badge. He waited for what seemed like an age, he was unusually aware of his breath as his chest heaved heavily, his heart slowly prickling with adrenaline as nervousness began to pervade his being. “Goruss Clogg?” He said again, pressing the badge. Again there was no answer. “Doctor Jones to Captain Girling!” He said finally. “Problems?” Haldo asked, noticing the expression on Blake's face. Blake started over to the others, nodding his head angrily. “So they are Section 31?” Haldo nodded with disappointment that their suspicions were correct. Suddenly the three of them vanished in a flickering blue light as they got close enough to the ship to beam aboard. “Where’s my shuttle?” Blake growled as he appeared on the bridge. Blake breathed heavily and stood for a moment in thought. “Clogg?” He asked finally. “Can you do it?” He spun around angrily to his engineer as his determination flushed away any thought of self-preservation. “What are you waiting for?” The Captain growled angrily with a twisted grin as his eyebrows pitched down aggressively. The Corinthian's thrusters fired as the shields began to come to life, surrounding the ship with a powerful defensive barrier against incoming objects. The long vessel began to turn to the last known coordinates of the shuttle as the nacelles began to fold back tight into her sides to give her a fighting chance of getting through the structure. The rear thrusters fired and she took off into the massive engineering shafts that led to one of the irregular outcroppings of the gargantuan vessel. “So far so good!” Haldo grumbled, pointedly aiming his remark at the Captain as the viewer filled with the image of massive engineering equipment racing past the ships hull. “And how do we get out again?” Haldo asked sarcastically. “One day it could be you out there.” Blake turned to face Haldo with an expression that left little doubt of his sincerity. “How close?” Blake asked, his attention suddenly flicking back to the viewer. “Are you detecting life-signs?” Blake ran his hand over his head across the stubbly remains of his hair. “Too much distortion.” Haldo shook his head. “A Comm badge with a distress beacon would do it.” Haldo nodded. “I’m going.” Blake said as he stood up quickly and turned to the rear of the bridge and drew his phaser pistol. “I’m coming too.” Haldo stood up from his console with a doleful expression. “I need you here!” Blake told him with a small smile that let him know he appreciated his offer. Blake smiled widely and nodded his agreement. 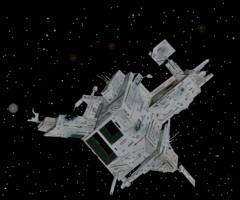 Blake and the others crawled stealthily towards the stolen shuttle. They hid behind a jutting pylon and peered out at the three Section 31 officers as they worked at the rear of the Type 6 shuttlecraft. The Captain was clearly highly agitated as the others carried a large device towards the ship between them, it was about a metre long and clearly required both of them to lift it and even then they were only capable of shuffling along slowly. “What is that?” Blake asked rhetorically. “So what do we do?” Haldo asked. “Do you have a better idea?” Haldo asked. “Come on…” Captain Povich barked as her colleagues struggled with the alien object. “What’s the damn hurry?” Her first officer gasped at her as sweat poured down his brow and his muscles burnt from the exertion. “We’re going as fast as we can!” Garret assured her with a knowing nod. “Shouldn’t we wait to get out of here?” Commander Garret frowned nervously as he hoisted himself from the floor. “We could be killed!” The Commander protested angrily. Suddenly the cabin of the small shuttle lit up with an orange blaze as the diffused phaser beam surged through the opening. The Commander muttered a weak sigh and collapsed to the floor. Captain Povich jumped to her feet in surprise, her heart fluttered and her eyes rolled back into her head as her world instantly melted into darkness. Captain Blake Girling peered into the shuttle behind the muzzle of his phaser pistol. She followed him quickly round the entrance and snapped open her medical kit. Clogg was laid quietly on the bench that ran along the starboard bulkhead, blood was caked around a deep gash on the side of his head. She ran her fingers over the wound as her tricorder scanned the extent of his injuries. “I’m working on it.” She told him flippantly as her attention was fixed firmly on her patient. “Blake…” Haldo called out from behind his tricorder. He turned to his engineer. “Blake, you’ll never guess what that thing is…” He told him as he gestured towards the cylindrical device the officers had been carrying. “Go on.” Blake told him. “It’s crude and corroded but I think it’s a Transwarp coil of some kind.” He said as he checked his findings. Blake took a deep breath and turned his back on the alien device. He glanced around the industrial machinery all round him. “The radiation is coming from a bay just over there.” Haldo pointed down a dim corridor beset with jumbled machinery. “The source of it?” Blake asked. While Ensign Katherine Rogers worked on Clogg's injuries with a phaser beside her in case the Section 31 officers recovered the other two headed off hesitantly down towards the source of the radiation. Although no different from the rest of the decaying vessel the silent menace seemed to grow with every step they took towards the bay at the end. Haldo glanced nervously around him as the shadows mocked him with their sinister dance. They coiled around his feet as if they could ensnare him with their jagged fingers and rake out his very soul. “We’re close.” He breathed as the sound of their footsteps echoed dully around behind them. “I can almost feel it.” Blake agreed, slightly disturbed. “What the hell is down there?” Blake shook his head, not at all sure he wanted to find out. They stepped up to the open hatchway and paused before stepping through. They looked at each other for a moment while they inwardly composed themselves. “I was with the others…” He furrowed his brow thoughtfully, trying to gather the tenuous threads of his memory back together. She ran her medical tricorder over his head to double check her work and didn’t notice what was happening behind her. She heard a sound and snapped around suddenly. Standing behind her was Commander Garret pointing her own weapon at her. She didn’t have time to rebuke herself for leaving it at her side before he fired. Everything flashed suddenly and the world melted painlessly into darkness as she crumpled to the floor and into a deep, bottomless pit of unconsciousness. “My god…” Blake murmured as the pair of them stood in awe. They were perched on the edge of a long gantry that had long since corroded away. The room was vast, a huge open space with a massive circular structure around a raised platform. Countless probes and devices were attached all over the metal beams and large walkways were fitted along the length of the sprawling structure. “Is it still active?” Blake frowned. “Then where is the radiation coming from?” Blake huffed in exasperation. Blake stepped back to allow his engineer to reach the panel. He shrugged and wandered back to the gantry to stare out into the cavernous bay. “So much for benign.” Blake huffed. “Blake.” Haldo called out, backing away from the control panel nervously. “What have you found?” Blake felt a surge of alarm at the sight of Haldo’s ashen face and expression that approached sheer panic. “You better see this…” He gasped, swallowing hard to clear his throat. Blake kept his eyes locked onto his as he stepped slowly past him towards what he had found. He breathed heavily and turned his attention to the display. “Oh god…” He whispered as a bead of sweat prickled on his brow and his heart raced. The control was flickering erratically but the logo was clear enough. A few simple lines making a claw but they both knew what it meant, it had a meaning beyond the symbol. The pair walked along the shaft as if life had kicked a part of their souls through their chests. They were deflated by the shock, both of the intended purpose of the machine and by knowing who the people were who had built it. “A five thousand year old Borg vessel.” Blake muttered in disbelief, the full impact not yet settling in. “The Borg.” Blake said in disgust. “Well they finally found something they couldn’t process.” Haldo smiled weakly, holding up his tricorder with his findings on it. “The organic residue?” Blake asked, hoping to hear something positive. “The radiation is coming off of it. It was probably some kind of complex energy being until they went to work on it.” Haldo explained. “So they killed it?” Blake shrugged. “So the original Borg crew probabaly turned on each other too?” Blake grinned wickedly at the thought. Suddenly there was a loud groaning sound as the massive engineering sections began to shift and then an ear-splitting crack as brilliant white flash cascaded up the shaft behind the Corinthian. The whole vessel began to shift, the floor seemed to ripple beneath their feet and the walls began to quake. “We better move…” Haldo said with growing alarm. Girling and Compz ran out of the shaft to the bay where the shuttle was docked. A beam of energy snaked out of the open hatch as the door began to noiselessly close up. “Katherine!” Blake called out as he jumped to the floor reflexively and pointed his phaser towards the opening. Girling slammed his fist angrily into the floor panels in frustration and they buckled easily as he did so. Suddenly another crack exploded out from behind them as the charges began to tear through the stricken vessel. With a sickening crash of grinding metal a pile of debris fell from above. “Blake!” Haldo cried out in fear as he jumped up, ignoring the shuttle's potential threat. He fell back from his feet and landed awkwardly in horrified surprise. His friend lay motionless, his eyes glassy and staring sightlessly forwards. A large metal pipe was embedded through his chest and blood was trickling from the corner of his mouth. “Blake?” He whimpered softly, the words sticking in his throat. Blake shuddered slightly and his arm fell limply to the side as a gasp issued from his open mouth. The shuttle's impulse engines flared and the small craft vanished into a tunnel as the ancient Borg vessel began to collapse in on itself. Admiral Crowe shook her head sorrowfully as Captain Povich finished speaking. “We never saw them again.” She said after a lengthy silence. “Our engineers had done most of the work already.” She agreed. “We activated it when we beamed aboard from the shuttle. “So as well as the deaths of the crew of the Corinthian and the loss of an experimental ship you also stole and wrecked a prototype vessel and lost most of your own crew?” The Admiral glowered at her as if scolding a small child. “Yes, sir.” She said finally. “The message?” Captain Reader asked, his expression one of stony severity. “We relayed it back to the co-ordinates.” She replied. Ensign Katherine Rogers sat in silence on her guest quarters aboard the Olympus, staring out into the myriad stars. A bleep issued behind her and it took a moment for her mind to rouse itself to realise what it was. “Come in.” She said, turning from the window and marshalling her thoughts. The doors slid open as Captain Reader and Admiral Crowe stepped in to join her. “He’s doing well.” Admiral Crowe told her. “That’s good.” She smiled broadly. “Of course.” The Admiral told her with a smile. Haldo Compz stood at the heart of the Corinthian's bridge as Katherine appeared in the middle of a transporter beam. “I’ve been better.” She sighed. “It’s been a long week.” He agreed with a heavy outward breath. “Good for an aggressive sentient lobster!” Haldo winked. “What about Blake?” She asked, her hands clasped behind her back. Katherine stepped into the Captains ready room at the side of the bridge. Her heart was pounding and sweat prickled uncomfortably around her neck. “How are you feeling?” She asked with an uneasy smile. “I’m fine!” Blake told her with a grin as he patted his chest. “I read the report.” He told her as he lifted his frame from the chair and stepped up beside her. “Apparently being killed isn’t the handicap for me it once was.” He told her softly with a warm smile. “I thought you’d all died.” She hung her head. “She’s a tough little ship.” He told her. “We all make mistakes.” He smiled and put his hand on her shoulder. “This one nearly killed you all.” She gritted her teeth as the first salty tear escaped and began to trace its way down her cheek. “I’m just so sorry.” She said simply. “I told you.” Doctor Jones rocked proudly on his heels. “It could get you arrested if Blake ever tells anyone who you are.” Haldo told him. “Is our Transwarp coil up and running again yet?” Jones smirked. “You have to admit that this is a great ship!” The Doctor bated him again. “Maybe this one is as good as its designer…” He gloated as he turned to leave. “Oh?” He grunted a reply.